A very good friend of mine is a bonafied race car driver. I was over at his house the other day and he showed me how drivers prepare for and practice racing when they can't get to the track. He and his fellow drivers play something called I-Racing. It's an internet-based video game where you can race other people on very realistic tracks found around the world. My friend has a set up where he has pedals, a steering wheel, and paddle shifters to make his gaming experience more true to life. That got me thinking... I wonder what kind of cool gaming chairs must be out there. With technology as advanced as it is today, there must be some pretty sweet set ups available for gamers. A few clicks of the mouse and my search came up with some unique stuff! Now THIS is a gaming chair made for race car drivers! Force Dynamic's 401 Driving Simulator is the ultimate driving set up. Cost? $55,000 to $70,000. Ouch! The steering wheel is attached to the huge video monitor screen. I'd bet a lot of money it's high definition with surround sound speakers that would blast car engine rumble and revving! Have you ever heard a real race car up close? Crazy loud! The 401 also uses gravity to make you feel the sensations of acceleration and deceleration. It actually pushes you back into the seat when you go faster and drops you down when you slow down. But with that price tag, you better really love racing! I like this one because it is streamlined and super stylish. And my favorite color is red. This one would give you that video game arcade feeling. And even look awesome in your living room since the styling is so modern and cool. Nothing pretty or stylish about this gaming chair, but for video gamers, I bet that huge foot rest and side table would come in very handy after the 6th hour of playing! I wonder if that foot rest has any gaming functionality? Another sleek, and kind of stylish design of this one combined with the steel (or maybe it's titanium!) makes this gaming set up another favorite of mine. 3 video screens! Forget gaming, I want this one to blog on. Or watch movies on. Wow! What is this crazy apparatus? First impression: torture chamber. Put this cool gaming chair in your home and you won't be able to keep the kids away. And when I say kids, I mean your husband and his buddies. 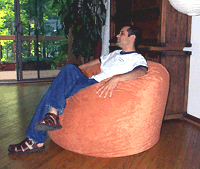 Bean bag chairs have been popular gaming chairs for decades. You can't go wrong with the comfort and flexibility of a bean bag. It may not be as fancy (or pricey) as the others I've found, but it's still great since it will move with you. Combine that with a washable cover, water-repellent liner, and tons of styles, you can find the perfect one for your gaming needs at www.ahhprods.com (I had to put in a plug, but seriously, our bean bags are awesome gaming chairs). And let's not forget the kids! No way you're spending thousands of dollars so they can play video games right? 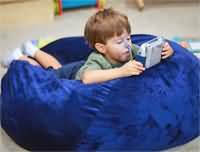 That makes bean bag chairs the ultimate solution and obvious choice for kids. Next blog post... gaming-inspired tables!